Eugène Delacroix, France’s leading romantic painter of the first half of the 19th century, advocated the opposite aesthetic of his contemporary, Jean–Auguste–Dominique Ingres. In contrast to Ingres' controlled images that are characterized by his interests in linear purity and a finished surface, Delacroix championed the primacy of color and quick execution as expressive of the artist's imagination. The Arabs Skirmishing in the Mountains was painted a few months before the artist's death. It harks back to Delacroix’s first and only visit to North Africa in 1832, more than 30 years before this picture was painted, an excursion that made a deep impression on him. The figures and horses are placed on a diagonal that traverses the lower right foreground plane. The action then shifts to the middle ground as a horse and rider charge towards battling Arabs in the center. The background abruptly rises into a craggy landscape, with a fortified castle and a line of mountains blending with the clouds. The fluidity of Delacroix's brushstroke animates the composition, heightening the violence of the scene and the moment when the rider is thrown off his horse. The brilliant use of red, blue, and white forces the eye to stop at each grouping, accenting the rhythm of the battle itself. Delacroix has created a fictive battle, his work not only recalling an earlier personal experience but also stimulating the imagination of his viewers. lower center: Eug. Delacroix 1863. Sold 12 April 1863 by the artist to (Tedesco Frères, Paris). Edouard André, Paris, by 1878 until at least 1885. A. Smit; sold 4 February 1893 to (Durand-Ruel et Cie, Paris); (Durand-Ruel et Cie, New York), December 1895; sold 6 March 1896 to Matthew Challoner Durfee Borden [1842-1912]; (his estate sale, American Art Association, New York, 14 February 1913, no. 77); (Durand-Ruel et Cie, New York); sold 17 February 1913 to James J. Hill [d. 1916], St. Paul; his son, Louis W. Hill [1872-1948], St. Paul, by 1930; his son, [James] Jerome Hill [1905-1972], New York and Cassis, France, by 1962; purchased 15 December 1966 by NGA. André Joubin, Correspondance generale d'Eugène Delacroix, 5 vols., Paris, 1936-1938: IV:372. According to Maurice Sérullaz, Mémorial de l'exposition Eugène Delacroix organisée au Musée du Louvre à l'occasion du centenaire de la mort de l'artiste, Paris, 1963, no. 532, André lent the painting to Delacroix, Musée du Louvre, Paris, 1878, no. 77. The painting is still listed in André's possession in Alfred Robaut, L'oeuvre complet de Eugène Delacroix, Paris, 1885, no. 1448. This is probably the Edouard André whose collection, with that of his wife Nélie Jacquemart, comprises the Paris museum which bears their names. Smit/Durand-Ruel/Borden provenance according to Maurice Sérullaz, Mémorial de l'exposition Eugène Delacroix organisée au Musée du Louvre à l'occasion du centenaire de la mort de l'artiste, Paris, 1963, no. 532 citing the Durand-Ruel Archives. According to a letter from Dr. Jane Hancock dated 28 August 1992 in NGA curatorial files, quoting an unpublished inventory of Hill's collection in the James J. Hill Papers, James J. Hill Reference Library, Saint Paul, MN. According to the exhibition catalogues Centenaire du Romanticisme: Expositions E. Delacroix., Musée du Louvre, Paris, 1930, no. 199a, and Loan Exhibition of Paintings, Drawings, Watercolors, and Prints by Eugène Delacroix, Art Institute of Chicago, 1930, no. 45, the painting was lent by James J. Hill's son, Louis. Lent by [James] Jerome Hill to the Delacroix, The Art Gallery of Toronto and National Gallery of Canada, Ottawa, 1962, no. 25. Tableaux anciens et modernes exposés au profit du Musée des Arts Decoratifs, Musée des Arts Décoratifs, Palais des Tuileries, Pavillon de Flore, Paris, 1878, no. 77, as Combat d'Arabes. Courbet and Delacroix, Marie Harriman Gallery, New York, 1933, no. 27, as La Perception de l'Impot Arabe. Masterpieces of Art. European & American Paintings 1500-1900, New York World's Fair, 1940, no. 249, as Arab Tax Collecting. Delacroix, The Art Gallery of Toronto and the National Gallery of Canada, Ottawa, 1962-1963, no. 25, repro. The Orientalists: Delacroix to Matisse, The Allure of North Africa and the Near East, National Gallery of Art, Washington, 1984, no. 17, repro., as The Collection of Arab Taxes. Eugène Delacroix (1798-1863): Paintings, Drawings, and Prints from North American Collections, The Metropolitan Museum, New York, 1991, no. 14, repro. Delacroix, les dernières années, Galeries nationales du Grand Palais, Paris; Philadelphia Museum of Art, 1998-1999, no. 139, repro. Eugène Delacroix, Staatliche Kunsthalle Karlsruhe, 2003-2004, no. 223, repro. Piron, Achille. Eugène Delacroix, sa vie et ses oeuvres. Paris, 1865:111, as Perception de l'impôt arabe. Robaut, Alfred. L'Oeuvre complet de Eugène Delacroix, peintures, dessins, gravures, lithographies. Paris, 1885: no. 1448, as Perception de l'impôt arabe. Moreau-Nélaton, Etienne. Delacroix raconté par lui-même. 2 vols. Paris, 1916:II:207, fig. 430, as Combat de Marocains. Meier-Graefe, Julius. Delacroix. Munich, 1922:233, repro. Hourticq, Louis. Delacroix, l'oeuvre du mâitre. Paris, 1930:181, repro. Correspondance générale de Eugène Delacroix. 5 vols. Paris, 1936-1938: IV:372. David, Richard S. "The Collection of James J. Hill." The Minneapolis Institute of Art Bulletin 47, no. 2 (1958):16, 27, repro. Huyghe, Rene. Delacroix. New York, 1963:416-417, 424, 538, repro. pl. 319. Maltese, Corrado. Delacroix. Milan, 1963:179, no. 100, repro. Prideaux, Tom. The World of Delacroix, 1798-1863. New York, 1966:172, 179, repro. European Paintings and Sculpture, Illustrations. National Gallery of Art, Washington, 1968: 33, repro., as The Arab Tax. European Paintings: An Illustrated Summary Catalogue. National Gallery of Art, Washington, 1975: 102, repro. Watson, Ross. The National Gallery of Art, Washington. New York, 1979: 106, pl. 92. Johnson, Lee. 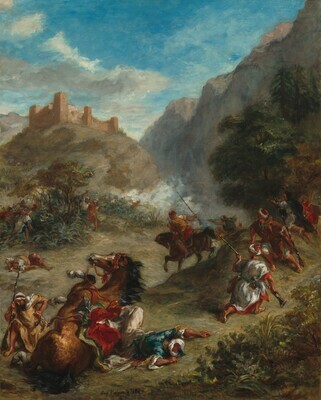 The Paintings of Eugène Delacroix. 6 vols. Oxford, 1981:3:21, 211, n. 419, repro. pl. 227. Rosenthal, Donald. Orientalism: The Near East in French Painting, 1800-1880. Exh. cat., Memorial Art Gallery of the University of Rochester, 1982: 69, repro. Walker, John. National Gallery of Art, Washington. Rev. ed. New York, 1984: 424, no. 606, color repro. European Paintings: An Illustrated Catalogue. National Gallery of Art, Washington, 1985: 124, repro. National Gallery of Art, Washington. National Gallery of Art, Washington, 1992: 179, repro. Jobert, Barthélémy. Delacroix. Princeton, 1997: no. 133, repro. Mittler, Gene A., and Rosalind Ragans. Understanding Art. New York, 1997: 212, fig. 14-2. Fiero, Gloria K. The Humanistic Tradition: Romanticism, Realism, and the Nineteenth-Century World. Madison, 1998: no. 29.5, repro. Eitner, Lorenz. French Paintings of the Nineteenth Century, Part I: Before Impressionism. The Collections of the National Gallery of Art Systematic Catalogue. Washington, D.C., 2000: 228-232, color repro. Hand, John Oliver. National Gallery of Art: Master Paintings from the Collection. Washington and New York, 2004: 359, no. 295, color repro.